May the Inspiration Be With You! As many of you know, I am on the board of Rancho Obi-Wan, a private nonprofit museum housing the world’s largest collection of Star Wars memorabilia. But not many of you know why I believe so strongly in this organization. Sure, I'm a huge fan. But what makes Star Wars truly special to me is the creativity and passion that connects us all as a community. Whether it is in the ways we meticulously scrutinize the details of the films, in the expressions we create and share as artists and makers, or in how we tirelessly hunt down little pieces of pop culture history to covet in our collections, we are a global community united by our shared inspiration. I have made many friends and have had many amazing experiences as a part of this community, and I am so thankful for all of them. Rancho Obi-Wan shares my passion preserving the incredible legacy of Star Wars films and merchandising, and the organization is dedicated to celebrating Star Wars fandom and creativity. Most importantly though, Rancho Obi-Wan is committed to showcasing that creativity in ways that inspire others to pursue their dreams. I am proud to contribute to Rancho Obi-Wan and its mission to inspire kids and the kid in all of us. But it takes more than the dedication of volunteers like myself to help Rancho Obi-Wan fulfill its mission. 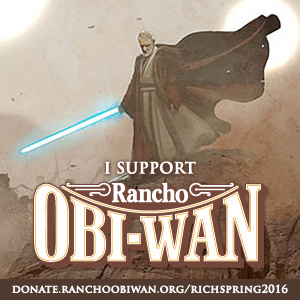 Help me support Rancho Obi-Wan by making a donation. Even a small donation makes a difference! Donate now because your combined resources can ignite even more dreams and creativity in this world. Every donation of $45 or more receives a one-year membership to Rancho Obi-Wan and a special Thank You gift! Thanks so much for your support! Please share what you love about Star Wars in the comments below and send this post to other Star Wars fans you know!